Genes are the different parts of the DNA that decide the genetic traits a person is going to have. Alleles are the different sequences on the DNA-they determine a single characteristic in an individual. Another important difference between the two is that alleles occur in pairs. They are also differentiated into recessive and dominant categories. Genes do not have any such differentiation. An interesting difference between alleles and genes is that alleles produce opposite phenotypes that are contrasting by nature. When the two partners of a gene are homogeneous in nature, they are called homozygous. However, if the pair consists of different alleles, they are called heterozygous. In heterozygous alleles, the dominant allele gains an expression. The dominance of a gene is determined by whether the AA and Aa are alike phenotypically. It is easier to find dominants because they express themselves better when they are paired with either allele. Alleles are basically different types of the same gene. Let’s explain this to you in this way- If your eye color was decided by a single gene, the color blue would be carried by one allele and the color green by another. Fascinating, isn’t it? All of us inherit a pair of genes from each of our parents. These genes are exactly the same for each other. So what causes the differences between individuals? It is the result of the alleles. The difference between the two becomes more pronounced in the case of traits. A trait refers to what you see, so it is the physical expression of the genes themselves. Alleles determine the different versions of the genes that we see. A gene is like a machine that has been put together. However, how it will works will depend on the alleles. Both alleles and genes play an all important role in the development of living forms. The difference is most colorfully manifest in humans of course! So next time you see the variety of hair color and eye color around you, take a moment and admire the phenomenal power of both the gene and the allele! 1. 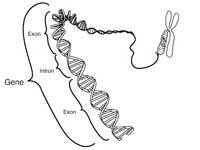 Genes are something we inherit from our parents- alleles determine how they are expressed in an individual. 2. Alleles occur in pairs but there is no such pairing for genes. 3. A pair of alleles produces opposing phenotypes. No such generalization can be assigned to genes. 4. Alleles determine the traits we inherit. 5. The genes we inherit are the same for all humans. However, how these manifest themselves is actually determined by alleles! Purpa Mukherjee. "Difference Between Gene and Allele." DifferenceBetween.net. April 12, 2018 < http://www.differencebetween.net/science/difference-between-gene-and-allele/ >. alleles produce contrasting phenotypes…what about genes?? confused!so what about genetic phenotype?? It seemed repetitive. Next time if you could go over something else, that would be swell! So allele alternative forms of nucleotide? How?? So allele alternative forms of nucleotide? How?? How? ?